Tea is, after water, the most consumed beverage on the planet. I have a theory as to why: Drinking tea slows time. When a cup is brought to the lips, there’s a shift in the universe, a moment lingers—holding the world still while we gather the part of ourselves that’s turning loose. Yet, I’ve never been one to collect teapots or tea cups like so many tea lovers do. I only own an Asian-style, iron teakettle. It’s coated with a green glaze and a dragonfly sits upon the lid. It’s simple, and reminds me that tea’s pure spirit isn’t pomp, but heart. My only tea-collector items outside of books are a set of tea towels that were hand embroidered by my grandmother some years ago. They stay safely tucked away in my cabinets, because I can’t bear to see them stained. Her clean and elegant stitching burrows along the fresh cotton leaving behind colorful teapots and flowers. “You’re like a teapot,” I used to say. “You must fill up, so you can pour out.” Great advice, but somehow these words always fell upon my own ears as little mumblings that didn’t relate to me. It was a long conversation. I really didn’t want it to end. I wanted to glean any last moments possible with her—just in case—and I was troubled by a problem that I felt only she could untangle. And even though I hated asking for help, I desperately needed her wisdom. I was not caring for myself. I didn’t understand why I could care for others and not me. If I had a need, it would be put off or buried under other things. Activities and responsibilities would pile up, but they weren’t for me. I was exhausted, empty. I needed to break this wrenching of myself once and for all. Maybe hearing her words would do it. My mind drifted with those words, thinking about how this had played out in my life. I had strangely taken it upon myself to mother the world. A person is lost on the street: I stop. An escalating fight is getting scary: I call 911. A friend is looking for a job: I write a recommendation letter. I stay late: for work, for friends. I can’t tell you how many times I’ve wanted to walk up to a girl—drunk and with her clothes half falling off on the street at night—and say, “Honey, what are you doing? Why don’t I put you in a taxi home?” Why did I believe that I could pour forever, telling others to rest, fill up, all while I ran dry, dry, dry? Tears sprang to my eyes. Images of my grandmother and me, eating at the tearoom in her tiny town, wading through antiques together, having our own little grown-up tea parties with her silver tea set, all came flooding back to me. Somewhere inside I was getting permission to take care of me. “You have to take care of yourself,” she stated one last time, making sure I heard her. Over the next few days before her surgery, I contemplated what she had said. I knew she was right. And I had recent proof. A few months earlier, I had lost my voice—my writing voice—the place where I hold church. It had dried up like bones in a desolate valley. There wasn’t one phrase—one thought—that welled within. Pages stared at me blank and indifferent. Self-loathing rose over me like a damp tent. My husband tried to help. “You need to play. Rest. Fill up,” he said. “Artists cannot do their jobs without play and rest.” I believed him but I struggled to do it. There was just so much to do, so many responsibilities, so many people in need. A few more weeks of dryness passed. He told me again, “You just need to rest. Play.” I tried here and there, but the dryness hung on, rusted and rigid. But I finally forced myself to take a day off after a long weekend—and then it happened. I sat down at the page and poured out freely. When I was done I hung over my desk and wept. I thought about my grandmother’s words, my weeping over my desk, and my iron teapot. I thought about all the tea I read about in books, the recipes, the tea towels; the teapots on the tea towels. I thought about all the times I mixed and blended. Had all of this been a message to me all along and now I was just getting it? A few weeks passed. I was still like a faun on shaky legs when it came to caring for me. But I was working on it. 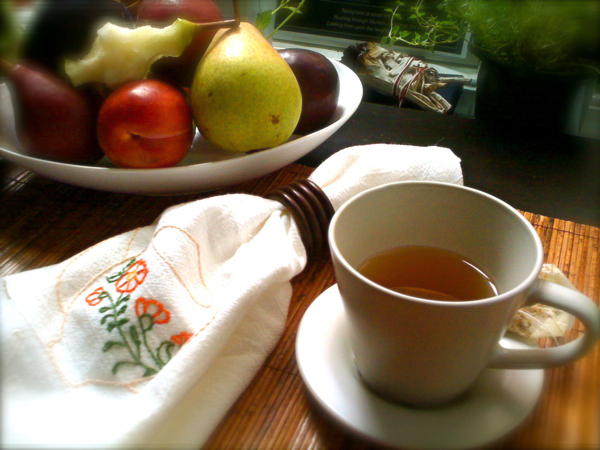 One Sunday afternoon I made myself some ginger tea and cut up some fruit to have as a snack. The end of the tea string had a special message “Delight the world with compassion, kindness and grace.” I guess I am part of the world, I thought. I went to the cabinets and pulled out my grandmother’s tea towels and admired her heartfelt work. She had lived through the surgery. We were told that when they pulled her out of anesthesia, she broke out into song. I think I get it now, grandmother. I think I really get it. Determining which recipe to share for this entry has been difficult. I keep being led down the rabbit hole, into books and magazines, and my own recipes—lost in tea dreams. 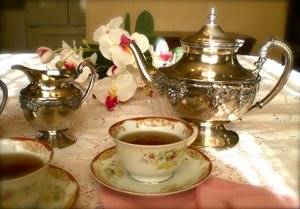 There are teas to clean the blood—burdock and watercress; or calm an anxious heart—lavender, orange, and chamomile. Either for comfort, pleasure, or strong medicine, there’s always something to pour. For now, here is my “Bad Day Tea Remedy.” Hopefully it will stop time for you, while you get a hold of yourself. Mix together and use as a loose tea. 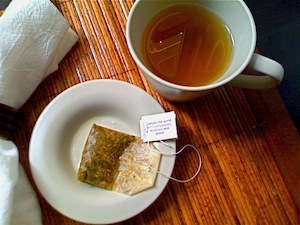 Yogi–ginger tea is pure and healing. Celestial Seasonings’ Tension Tamer–calms you and alerts you at the same time. McNulty’s–in NYC’s West Village has an amazing rose-oiled black tea that I serve hot, iced, and even use it to infuse deserts.